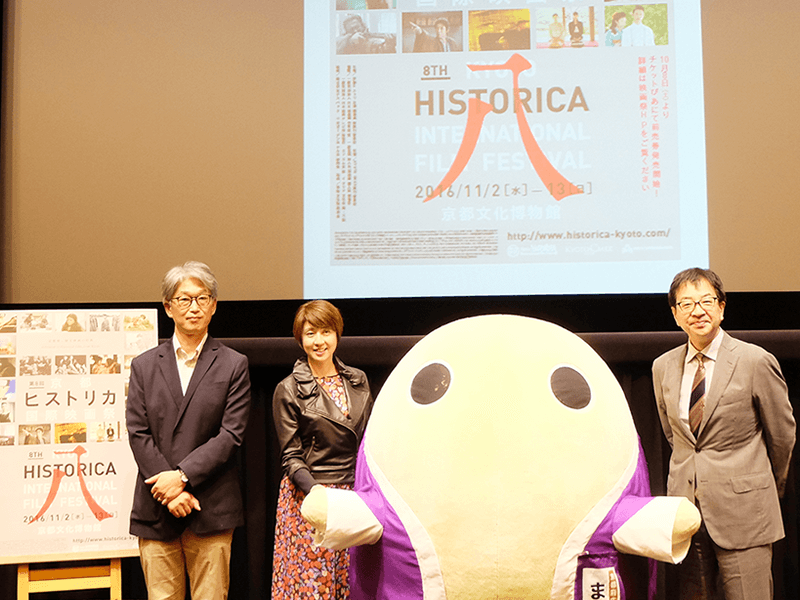 【Quick report of press release】 Historical film festival, “The 8th Kyoto HISTORICA International Film Festival”,the film shown is decided! The guests, Hollywood actor,Tommy Lee Jones and others visit! new cooperation project is substantial also! Historical film festival “The 8th Kyoto HISTORICA International Film Festival” will be held from Nov. 2 (wed) to Nov. 13 (Sun), 2016. Today, a press release was held in Kyoto and Osaka. All 22 screenings, guests, new collaborative projects was announced.In this article, we will introduce the attention points of the festival by the six categories, together with the state of the press conference. 1. 【HISTRICA Special】 Tommy Lee Jones’s attendence is decided! Attention film,”HISTRICA special” is selected to watch that can feel you changing of historical movies. This year, 2 films of are showing at the first time in Japan. The first film is that the opening showing 『BAHUBALI: THE BEGINNING』(India | 2015). About 4.1 billion yen production cost was spent. This work, is described as “Action super masterpiece” is a piece of director of S. S. Rajamouli who was known as making the flight of hero comedy movie, “McKee”. In india, it is recorded as the best, and is ranked as TOP 10 for the first time as an India movie in United States. A sequel will also be completed in 2017 and as for movie release in Japan, it will show at this festival. Should not miss this opportunity! The second film is 『Holmesman』 (America, France | 2014). The 19th century American Midwest. It’s announced by a tournament of Cannes international film festival in 2014. The work has became the topic of conversation as “about the secert of history of the United States”. A talk show was also held at the same time, and the guest was the director and also is a star of the work ,Tommy Lee Jones, who is known for such as “Men In Black” ,” the Fugitive” (Academy Award Winning), “JFK”, “Lincoln”, has been decided to visit! At the Kyoto HISTRICA International Film Festival, the guests such as directors and producers have been invited so far, but it is the first time for actors and big stars to come. Should not miss this opportunity! 2. 【HISTRICA World】 fun with parents and children, Japan・Kansai’s first showing 4 films! “HISTRICA World” have the new historical movie which is carefully selected from all over the world. In this year, 4 works in Denmark/Russia/Switzerland/China were chosen from the over 200 latest historical movie. Ms. Keiko Iiboshi of Historical Navigator says, “Overall, it’s a lineup that you can fully enjoy even if you come with parents and children. I hope you will come and enjoy with us at the festival”. 3. 【HISTRICA Focus】 A special feature on the evolution of 100 years of ninja films! “HISTRICA Focus“, the feature of fiftered ninja movies. is a special feature of ninja movies that fascinates the world! We show silent film and invite a variety of guests to understand them the evolution of ninja movies. 4. 【Collaboration Project with AFAA】Showing films nominated or awarded for academy awards across Asia! This year’s new project ,”Asia Cinerama – Asia Film Awards Academy Film Road Show“, is the collaboration project of “Asia Film Awards Academy (AFAA)”, the new organization for the Asiain established in 2014 and Kyoto HISTRICA International Film Festival. Five winning films nominated for the award at the past, will be shown. Talk event which invite the variety of guests is held,too. This year’s new project, “Kyoto Film Makers Lab. Screening ~Comeback Salmon Project~” is collaboretion project with”young filmmakers gathered from home and abroad” and “Kyoto Film Makers Lab. (KFL) which produce a historical drama with professional photographer in Kyoto”. The latest feature films of past KFL participants will be shown and also talking by supervision is included. 6. 【Collaboration Project with Ritsumeikan Univ. Colleage of image arts and sciences】 『SPRING SNOW』 appeared Satoshi Tsumabuki and Yuko Takeuchi is showing! The collaboration project of Kyoto HISTRICA International Film Festival and Ritsumeikan university. This year’s theme is “The representative fobidden love”. 『SPRING SNOW』(Japan | 2005) will show in Taisho era. Especially the love of male and female from childhood but are separated. It makes fantastic story through expressing gorgeous life and dreams of noble. Please enjoy of “intense and secret love of teenager”, expressed by Satoshi Tsumabuki and Yuko Takeuchi, and romantic of Taisho era that was pursued the concept of “love” . “Advance” and “Doors” are prepared for tickets, and the ticket fees are from 1,100 JPY to 2,000 JPY for each project. For more information on ticket prices and to purchase, please visit the official website ticket page. From now on, at the KYOTO CMEX portal site, we will send information and schedule of the “8 th Kyoto HISTRICA International Film Festival“, from time to time. Please visit the Kyoto HISTRICA International film festival official website for the latest information and showing schedule. We look forward to your participation. ★Tommy Lee Jones visited! Japan’s first showing. Tickets will be released on Oct. 8 (Sat), 2016. *We released more informations by official website from time to time.